Former PhD student working on diffusion of polymers in confined geometries. 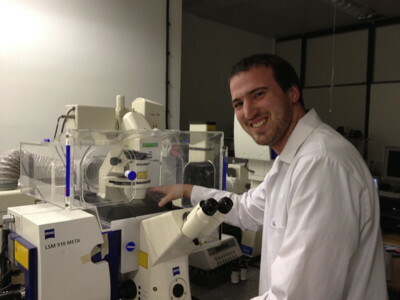 Chris Clarkson joined my group in October 2011 after obtaining a first class degree in Physics in Sheffield. Chris is working on surface diffusion of polymers as part of the low-dimensional chemistry project. He is here photographed with a confocal microscope, equipped with a fluorescence correlation spectroscopy head. It's all very impressive, and we expect great things from this undeniably and impressively posh student, who spent part of his formative years in India. (Chris does not like being called posh, but he doesn't seem to be complaining, which is probably because I'm the boss.) Actually, it gets better. It turns out that Chris's grandfather's second cousin is none other than the granddaddy of pop, Cliff Richard! On Wednesday June 24, 2015 Chris successfully defended his thesis before his examiners, Dr Sarah Staniland (University of Sheffield) and Professor Mark Leake of the University of York. Chris then spent a few weeks as a postdoc on the low-dimensional chemistry programme before taking up a career in teaching.